CENTECH, a Montreal-based technology incubator, announced earlier that it has selected a company founded by Dr. Etienne de Villers-Sidani for its Propulsion Program, which helps the most innovative start-ups move from the initial development phase to commercializing their products and services on the international market. Dr. de Villers-Sidani is a researcher and neurologist at Montreal Neurological Institute and Hospital (The Neuro) and member of the Center for Research on Brain, Language and Music (CRBLM). Dr. de Villers-Sidani's company, Innodem Neurosciences, has developed a patent-pending mobile application that will improve the effectiveness and quality of life and care of patients with neurological problems. 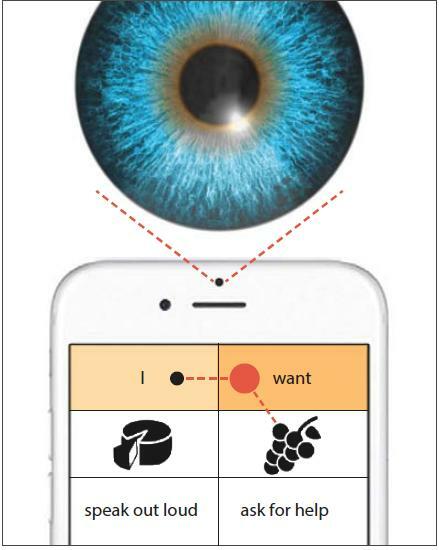 Innodem's eye-tracking technology for mobile devices allows patients that cannot speak because of paralysis (ALS, stroke, etc.) or intubation (intensive care) to communicate by simply gazing at various images on a tablet or smartphone linked to the patient's pre-recorded or synthetic text-to-speech voice messages. This innovation is meant to improve the less efficient message boards and standard of care that rely on third-parties rather than being patient-centric. Communication with several types of neurological patients is often only possible by tracking eye movements. Innodem's application can anonymously track these gaze patterns because its technology uses image-processing algorithms to capture eye movements with high precision using standard cameras found on most off-the-shelf electronic tablets and smartphones. The company believes that as more people use the app, the AI back-end that it is developing will help it launch other apps to assist the medical and pharmaceutical industry make better diagnostics for neurological diseases. Metrics can also be extracted for diagnosis or to follow illness progression. Innodem's current competitors require the use of proprietary hardware such as infrared cameras, reducing the availability and increasing the cost of such technology. Currently, eye-tracking systems designed for paralyzed individuals cost several thousand dollars, making them unaffordable for cost-sensitive healthcare institutions and most patients. Innodem's technology on the other hand will be software-based and thus very affordable. Innodem Neuroscience technology is a result of Dr. de Villers-Sidani's work at The Neuro developing novel therapeutic strategies that can improve cognitive function, communication and quality of life in patients suffering from various neurological conditions, including neurodegenerative disorders and strokes. CENTECH's Propulsion Program will come with a $10,000 award and access to leading edge infrastructure, equipment and software, mentorship and networking opportunities. "With Innodem and the arrival of Dr. Villers-Sidani's team, CENTECH will concretize its vision of bringing together a concentration of the best Med Tech start-ups under one roof," explained Richard Chénier, CENTECH's Director General. "We are developing a true community of expertise in this field, here in Montréal, thanks to best of class institution such as The Neuro." Created in 1996 by the École de Technologie Supérieure, and located in the heart of Montréal's Quartier de l'innovation, CENTECH is a start-up company launcher dedicated to technological tools and other advanced technologies with high growth potential. Recognized by UBI (University Business Network) as one of the world's most effective accelerators, CENTECH acts as a veritable growth machine. It has created one of the greatest densities of high-level tech entrepreneurs in Canada.